عکس- ابتدا طرفداران حزب کمونیست (استالینیستهای طرفدار روسیه) به مردم در پناه پلیس تیر اندازی کردند. برای بزرگنمایی روی عکس کلیک کنیم. Video: Civilians from “Euromaidan” crowd attempt to rescue people from the burning Trade Union house. بیانیه ی آنارشیستها در زیربرای خواندن بیانیه به زبان فرانسه روی تیتر زیر کلیک کنیم. 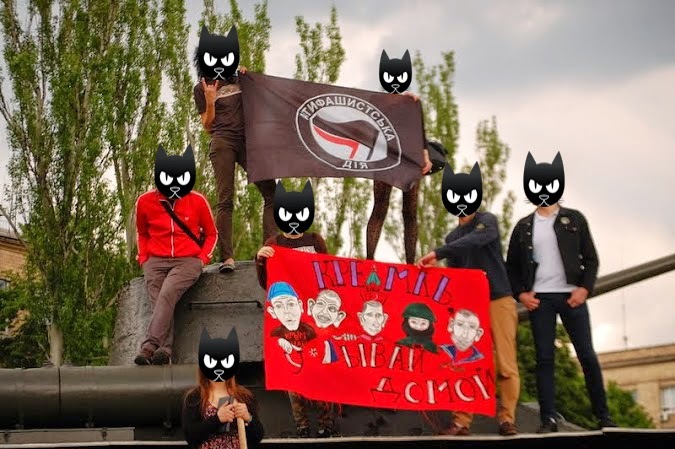 More than 40 people were killed and nearly 200 were wounded in the tragic clash of right-wing combatants in Odessa on May 2: football hooligans and Euromaidan self-defence on the one side; Stalinists, pro-Russian paramilitaries and local police force on the other. It started as a belligerent mob, comprised of men with “St. George’s ribbons” and red armbands (such armbands were also spotted on some police officers), wielding clubs and firearms, approached the march “for united Ukraine” which was made up of right-wing football hooligans joined by a large crowd of civilian people. As fighting began between the sides, the riot police provided cover to the attackers and cooperated with them. 4 people were killed. It is noteworthy that in the previous days the Antimaidan protesters had repeatedly marched along the centre of Odessa and never met any physical counteraction either from their political opponents or the police. Civilian “pro-Ukrainian” crowd didn’t disperse after the shootings; enraged, they started the counterattack. As the fighting became sufficiently intense, some of pro-Russian combatants withdrew to the Afina trading center, which was then blocked by the police. The crowd, incited by hooligans, followed the other part of the attackers and proceeded to rout the Antimaidan camp, located near the Trade Union house. The Antimaidan protesters fled to that building and then the entrances were barricaded. It should also be noted that Alexey Albu, leader of Stalinist Borotba organization, personally urged protesters to come inside the blocked building, although never joined them himself. We see this as a proof enough to any left or anarchist organization in the world to sever any ties, either financial or informational, with this organization. By sending them money you would fund the civil war; by spreading their statements and supporting them morally you would contribute to their war propaganda. Violence continued, as Euromaidan crowd surrounded the Trade Union house and combatants from both sides fired shots and hurled Molotov cocktails both to and fro the roof of the building. At this moment is still unclear which factor contributed the most to the fire, which burned some and suffocated others to death. We are sure that the violence of right-wing hooligans was the integral part of this tragedy. However, it is clear that this violence was planned for and counted on. The people who should also be held responsible are the pro-Russian instigators and the local police, who supported them. Members of AWU wish to express their deepest mourning for the victims. They fell prey to the interests of the forces that consistently try to instigate a civil war in Ukraine. Sadly, large parts of the working class are disoriented and serve as merely blind puppets in the hands of such forces, giving their lives for utterly stupid and meaningless things and ideas. The immediate effect of the escalation of this tragically pointless conflict is the split of the working class in Ukraine. While some workers are threatening with a political strike in support of the Antimaidan, several members of the (pro-Maidan) Confederation of Free Trade Unions are being kidnapped by Antimaidan forces. Instead of taking a united stance against the neoliberal policies of the government, proletarians are busy fighting each other for the interests of various bourgeois cliques. The final result of such policies will be a civil war in Ukraine, which will mean an ultimate catastrophe for the working class. We are not pacifists and will be at the side of the working class whenever it fights against the bourgeoisie, no matter what forms this fight takes — but this is not the case in Ukraine nowadays. The disoriented and weak proletariat will be busy engaging in self-destruction; the outcomes will be drastic fall of life standards, rise of unemployment and criminal activities, and loss of huge number of lives. All prospects of working-class self-organization and mobilization will be buried for some time. We can see that this scenario is being pushed forward by the alliance of various right-wing groups, nazis, conservatives and Stalinists. It is important to understand that Antimaidan cannot be considered a “working-class social protest”: the typical demands of this movement in various towns are dictated by the most reactionary clerical conservatives (abolition of electronic IDs because they include “the Number of the Beast”; banning of vaccination; etc.) and have little to do with the interests of workers. On the other hand, we are disgusted by the reaction of the right-liberal and patriotic general public which takes delight in the Odessa deaths. However wrong the killed people might have been, they shouldn’t have died in this brutish accident. As Ukrainian workers side with various warring right-wing movements, they are sliding further from socialism to barbarism. The cure is well-known: we should realize our own class interests, organize at workplaces and direct our rage against the real enemy, not at each other. In days like these global workers’ solidarity means very much. The global working class is doomed to eliminate itself: either in the process of social revolution and construction of a classless society or in the process of a barbaric all-out war. 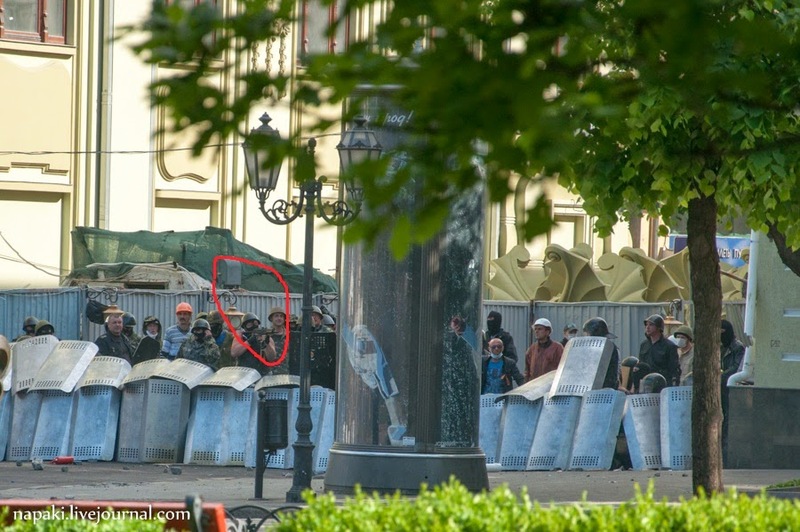 Here you can see this man standing in the midst of an armed attack by pro-russian paramilitaries, unharmed. Later, he urged people from Antimaidan to come inside the barricaded building, but never came inside himself, to ensure his personal safety. We see this as a proof that Alexey Albu was aware of the provocation, and acted in order to make it happen.